To mieszkanie Lizbona jest idealnym miejscem na rodzinne wakacje lub po prostu wyjście z przyjaciółmi. Z 2 sypialni, pozwala na łatwe pomieścić do 5 osób i posiada wszelkie udogodnienia, takie jak: Internet bezprzewodowy, klimatyzacja, pralka i kuchnia z pełnym wyposażeniem. Przyjdzie dzień zwiedzania miasta lub spędzić dzień na relaks, docenią Kuchenka mikrofalowa, suszarka do włosów, telewizję kablową lub żelazo żelazo. Inne ważne obiekty, aby Państwa pobyt był jak najbardziej przyjemny to: balkony, DVD Blu-ray, ekspresem do kawy i tosterem. pokochasz swój pobyt w tym lokalu w małym budynku z XVIII wieku, pełna światła i oddycha Lizbonę. We throughly enjoyed our week+ time we spent at Brigita's apartment in Lisbon. The owner was there to great us and tell us everything we needed to know about the year and the apartment. She was available on a daily basis as she lives in the same building two floors above our apartment. The apartment was comfortable and clean. Closet space for our clothing was good between the two bedrooms. Our only issue was the hot water for the shower. At times it would quickly go from hot to cold. The location of the apartment is great. I believe it is the best location that you can stay in when visiting Lisbon. Petit appartement très bien conçu. Petit appartement très bien conçu. Tout y est au top. Juste dommage que les gens dans la rue n’aient pas l’idee de ne pas hurler la nuit. Wir hatten einen angenhemen Aufenthalt in dem Appartment. Es liegt direkt im Zentrum, nicht weit vom Rossio-Platz entfernt. Vieles ist gut zu Fuss zu erreichen. Auch die Metrostationen Rossio oder Baixa-Chiado sind nicht weit. Für bis zu vier Personen ist die Wohnung optimal, bei fünf Personen wird es etwas eng, zumal das Sofa, das zum Schlafsofa umfunktioniert wird, nicht sehr bequem ist. Wir als Familie (2 Erw,3 Kinder) haben unseren kurzen Aufenthalt dennoch genossen. Lovely apartment. Very clean. Perfect for the two of us. Location was fantastic. We were able to walk or take transit easily. Brigida is a great host. Excellent communication. Very helpful. The restaurant downstairs is very good. Our family of 5 enjoyed our stay in Lisbon. 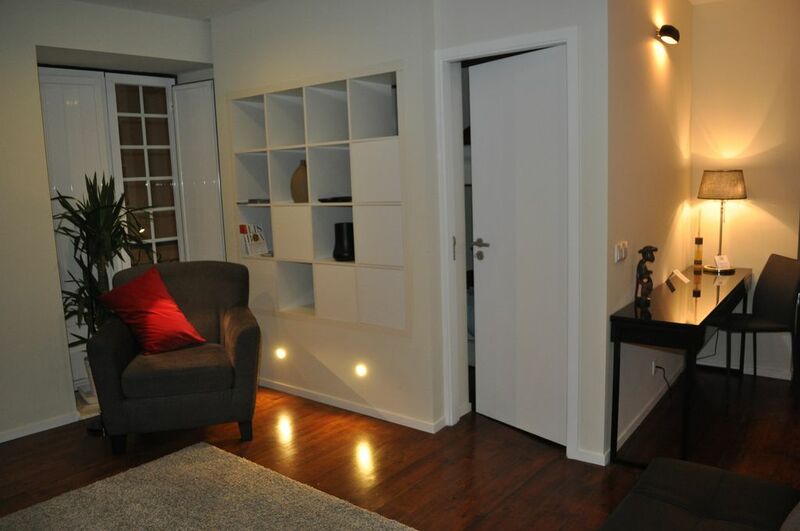 Apartment is as advertised, clean, comfortable and within walking distance to the city center. Brigida is a great host and was very helpful with city suggestions and ordering a taxi for the airport. Great experience overall. - 100 metrów znajduje się Centralny dworzec kolejowy, aby przejść do linii Sintra. - Przystanek taksówek jest mniejsza niż 50 m, a dolna metr / Chiado 100 metrów.